SAO PAULO -- Amid the bleak economic landscape of South America's fallen giants, Lexus is carving out a niche that it hopes will flourish when the boom-and-bust cycle inevitably turns. A latecomer to the market, Lexus has seen sales in its Latin America region -- which includes South America, Central America and the Caribbean -- rise by 32 percent so far this year, on top of a similar performance in 2015, Lexus executives said. It has been the fastest-growing region for the brand globally over the last two years. Those impressive numbers came from just seven dealerships in seven major cities with total sales estimated at about 2,100 vehicles by year end. 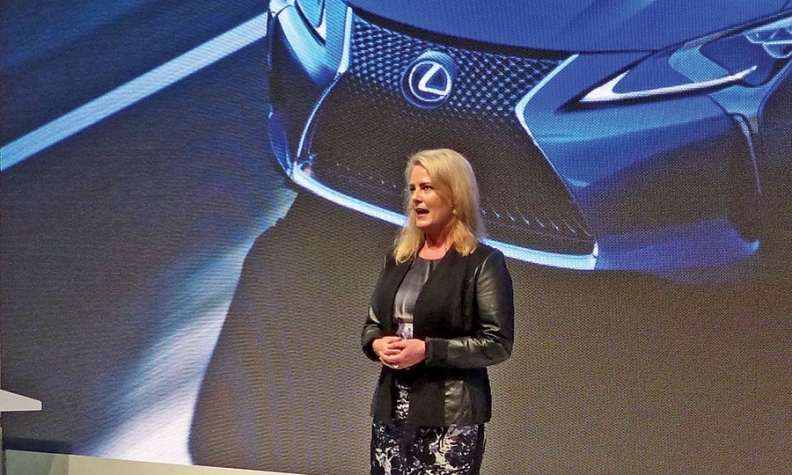 Lexus' regional market share in the luxury segment grew to 2.9 percent this year from 1.9 percent in 2015. "It's not huge," said Jaycie Dane, general manager for Lexus in the Latin America and Caribbean region, on the sidelines of last month's Sao Paulo auto show. "We want to establish ourselves as the No. 1 brand for customer experience. If that gets us to huge volume one day, awesome!" Lexus has a single dealership in major cities of Brazil, Chile, Peru, Bolivia and Costa Rica. Temporary stores in Panama and the Dominican Republic will move into proper showrooms by mid-2017. Lexus' sales are a small fraction of market leaders Mercedes-Benz, BMW and Audi, all of which have factories in Brazil that enable them to avoid a 35 percent import tariff on key models. Jaguar Land Rover also opened a plant there in 2016. Brazil is by far the region's biggest economy, which doesn't include Mexico because it's part of North America. Dane, an American who has held several sales positions with Toyota in the U.S., said Lexus is competitive on core models even though all of its vehicles come from Japan and must pay the import tax in Brazil. Other Latin American nations don't have the tariff, which helps level the playing field. The NX crossover, which was introduced in the region in 2015, quickly has become the brand's most popular model in Latin America and competes on price with the best from Germany and the U.K., she said. "Is it perfect on every model? No," Dane said. "But on our core models, our volume models, we work to be as competitive as possible." Lexus didn't launch in the region until late 2012, mostly missing the commodity boom that had made Brazil and some of its neighbors among the fastest-growing economies in the world. Brazil auto sales that year were a record 3.8 million vs. an estimated 2.1 million for this year. While Brazil's sharp recession has been the most notable because of the nation's sheer size, economies throughout the region have been contracting. Even the exceptions, such as Peru and Bolivia, remain delicate because of weak commodity prices. Still, Dane said, there are reasons for optimism going into 2017, and Lexus plans to add a smattering of new dealerships across the region to take advantage of the improving economic climate and the strength of the luxury segment in particular. The general auto market was down 20 percent in the region last year while the luxury market grew 15 percent, she said. About 70 percent of consumers moving into the luxury market are coming from nonluxury -- a huge pool of young, wealthy customers. The mood at the Sao Paulo show -- the premier event for the region -- was noticeably more upbeat this year than previously, attendees said. And the local unveiling of the hybrid version of Lexus' new halo car, the LC 500 coupe, drew lots of media attention. "We do plan on growing," Dane said. Peru just opened a second location, and Chile is looking at a second store as well. "And then in Brazil, we're going to be moving from one dealership to 10 dealerships next year." Argentina, another top economy in the region, recently removed a high luxury tax. That has Lexus looking at a possible launch there. Expansion of the brand to still more countries could be in the cards, but its focus for now will remain on sustainable growth, Dane said. "Anytime we've gone to a new country, globally, our goal is to have profit after three years and a return on investment after four years," she said. "And we are achieving those goal here."